When the Salish Sea is spoken of, it usually elicits blank stares. When a picture is shown, nearly everyone recognizes the fish-hook-shaped crescent of water consisting of the Strait of Georgia, Strait of Juan de Fuca and Puget Sound that caps the northwest corner of Washington State. Wrapped around Vancouver Island, British Columbia, it’s only been officially and legally designated as a sea since 2010. The actual waterway has existed for thousands of years and has witnessed both natural wonders and the growth of modern civilization in its time. the multitude of islands peppering the Puget Sound and Strait of Georgia. There are a staggering 419 to explore. Both the islands and the mainland are carpeted in lush forests thanks to the considerable rainfall and rich volcanic soils. In fact, annual rainfalls exceeding 100 inches in spots supply rivers teeming with salmon. The Salish Sea itself supports everything from orcas and seals to crabs, oysters and clams. Before recorded history, Salish-speaking native tribes enjoyed a relatively wealthy existence due to abundant resources. Written Salish Sea history starts when explorer George Vancouver declared it British territory. In 1818, joint occupancy between the United States and Britain was established but was superseded by the Oregon Treaty of 1846 that established the current borders. Also around 1845, huge numbers of colonists poured in through the Oregon Trail. The settlers quickly moved to exploit the profuse timber and aquatic resources of the area. To complement fishing, shipbuilding developed later in the 19th century and peaked with WWI. Beginning with WWII, aviation manufacturing spurred growth in U.S. cities like Seattle, Tacoma and Bellingham and Canadian metropolises like Victoria and Vancouver. Present day high-tech businesses have kept things prosperous. One surprising Salish Sea fact today is that the region is home to around 8 million people. Whether you spent all of your childhood summers there or recently became enamored with the beauty, everyone can agree that the Salish Sea is an incredibly special place. 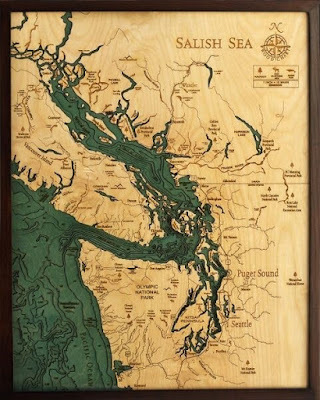 Bring the beauty into your home or bestow a gift upon a loved one with a Salish Sea Wood Map – a beautifully detailed laser-etched depth chart depicting the natural shoreline and underwater contours.